BORDEAUX, France, April 3, 2013 /PRNewswire/ — Ipan Ipan is expanding its range of Qi Wireless power cases by announcing the launch of a dedicated model for the SONYXperia™ Z. 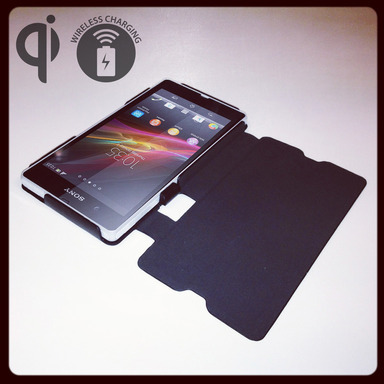 This flip case enables wireless charging on theSONY Xperia™ Z through magnetic induction. With its receiver module under patent, Ipan Ipan has succeeded in integrating the Qi wireless power standard into a custom-made case. This case with its invisible embedded module can be customized in several colours and materials. “This Smartphone was the most complex device we had to work on. Water-resistant and dust proof, it was not possible to have any access to the battery of the SONY Xperia™ Z through the back cover, or to use the Micro USB port. We had to implement a solution with the 2 Pin connectors normally used by the SONY Xperia™ Z docking station. The result is perfect and so thin that the embedded electronic is totally invisible,” said Olivier Dhervilly, VP Design & Development. “Our aim is to offer to OEM/ODM customers the largest range of Qi cases on the market. We have developed custom-made solutions to help our customers expand their own range of products. Flexibility and reactivity are key strengths of our Qi receiver’s modules under patent. In the past two months, Ipan Ipan has obtained Qi certifications for 4 dedicated Smartphone cases: Ipan Ipan now has the largest range of Qi solutions worldwide. We will continue our expansion by adding a Samsung S4 and an iPhone 5 solution this month,” said Michael Turbé, VP sales Ipan Ipan. The SONY Xperia™ Z flip case (with or without charging pad) is on sale now. The MSRP of the case is €39 and €89 for the pack with the charging pad. SHOCKER: Verizon Galaxy Note 2 DOES NOT support wireless charging.